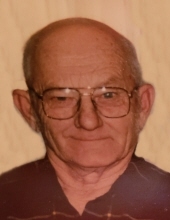 Robert Frank Plachetka, 90, Park Falls, died in the Park Manor Nursing Home in Park Falls on Wednesday, April 3, while under the care of Flambeau Home Health and Hospice., He was born in Berwyn, Illinois, on June 22, 1928, the son of William and Sylvia (Sykita) Plachetka. He served his country in the United States Army, and was stationed in Korea. He was married to Carol Smetak in Worthington, Minnesota, on November 3, 1951. He owned and operated Bob’s Auto Body in Fifield for many years until the time of his retirement. He was a member of the Park Falls American Legion Post No. 182. In his free time he enjoyed hunting, fishing, and gardening. He is survived by his wife, Carol Jean; by three daughters, Gloria (Ron) Jensen, Park Falls, Nancy Chahbouni, Neenah, and Judy (Steve) Hietpas, Little Chute; by five grandchildren, twelve great grandchildren, and by one great great grandchild. He is preceded in death by one grandson, Richard Ernest; by one brother, William Jr.; and by one sister, Blanche Zink. Memorial services will be held at 11:00 A.M. on Monday, April 8, at the Heindl Funeral Home in Phillips with Rev. Rick Haberland of the United Methodist Church of Phillips officiating. Military honors will be conducted by the Park Falls American Legion Post No 182. Friends may call at the funeral Home on Monday after 10:00 A.M.. Interment will be in the Lakeside Cemetery in Phillips. To plant a tree in memory of Robert Frank Plachetka, please visit our Tribute Store. "Email Address" would like to share the life celebration of Robert Frank Plachetka. Click on the "link" to go to share a favorite memory or leave a condolence message for the family.